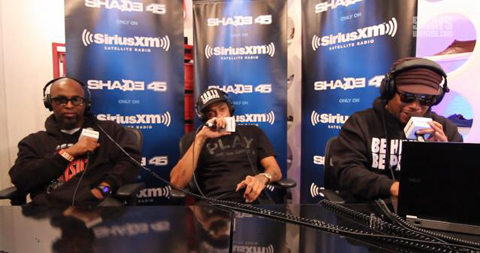 Watch in the first video to see Tech N9ne chopping it up with Sway, DJ Drama, Nipsey Hussle and Heather B. Both DJ Drama and Nipsey Hussle express their respect for Tech N9ne and the entire Strange Music organization, impressing upon everything from Tech’s impeccable breath control to the elevated standards Strange Music hold in all aspects of the grind. 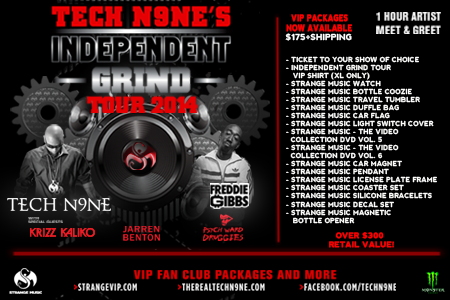 As a surprise, Tech N9ne brings out a VIP Package for his upcoming Independent Grind Tour for Sway himself. Thus adding more Strange merch to his collection! The second video sees DJ Drama’s first freestyle followed by Tech demonstrating his breath control skills by spitting his verses from “Worldwide Choppers” and “So Dope”. – What did you think of the videos?